All pianos should be tuned regularly, about twice a year is normal for a domestic piano that is played frequently. 1) Temperature fluctuations. Putting pianos near heat sources or in direct sunlight are constantly expanding or contracting and never settle. 2) Humidity fluctuations. If the piano is in an area where there is cooking, clothes washing or clothes drying etc., then this will also un-settle the instruments delicate balance. 3) Playing, the more its played and the harder its played, the more it will need tuning. Professional players and piano teachers often have their pianos tuned every 3 or 4 months, concert pianos are tuned for every performance to keep them sounding their very best. 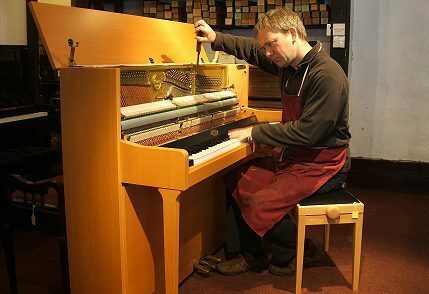 Tuning costs just £70.00 for a standard local visit to tune your piano and if neccesary sort out minor mechanical problems at the same time such as a squeaky pedal or a sticking note, as long as nothing is actually broken or needs a second visit. If it has been a long time since your piano was last maintained, extra visits or other work may be necessary at additional cost to bring it back to its best but no work that requires additional cost would be undertaken without prior consent.